Newly Renovated Private Home- Celebrate the Good Times, Simmons Pillow top Beautyrest mattresses, Sunny, Renovated and Spacious Private Ski House! 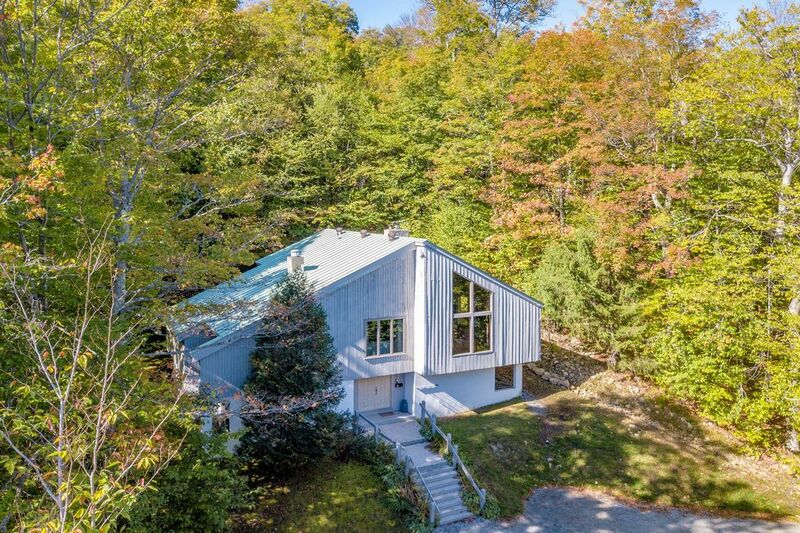 Contemporary 5 Bed Home on Ski Shuttle or 1 minute drive to Stratton Base. Everything you need for a memorable vacation or weekend getaway. Large foyer, Den/Game Room with Fireplace, Queen Bedroom, 2 x Twin over Double Bed Bunk Rooms, Swedish Sauna seats 6+, 4 Full Bathrooms w/Heated Floors, King Master Bedroom with Private Bathroom, King Guest Bedroom, Guest Bathroom, Very Large Sun filled Living Room with Cathedral Ceiling, Soft Leather Furniture, Stacked Stone Fireplace, Dining Room with Fireplace, and Large Eat In Kitchen with Bar Seating. New 60', 50' and 42' Flat Screen TV's with Comcast DVR, HBO Package. Hot Tub on deck (sanitized with each turnover), Sauna and lots of sunshine and space make this home a relaxing place to unwind all day or return from a great day of skiing, hiking , shopping, or exploring the region. Also available are guest passes to Stratton Sports Center where you can relax and enjoy the indoor pool, spa, work out equipment, tennis, massage, yoga and more. The house was perfectly situated and had all the amenities you would want for a family ski weekend - the shuttles were great, and we really enjoyed the sauna and hot tub after a day of skiing. Eric was very responsive to any questions we had along the way. We had a great time celebrating my husbands 30th with friends getting together from NJ NY and CT, it even snowed in November for us!!! We went in the hot tub and sauna they were easy to use and sooo fun!!! We played games, watched movies on the big screen TV and did some hiking close by! It was a great long weekend get away and would recommend the house for large groups- plenty of space for all!! Thank you Eric for renting to us!!! Thank you for your thoughtful note. Glad you and friends had a great stay. Please come back and visit again ! Our family of 11 had such a great time! We had plenty of room and we used the sauna, hot tub and extra space so well. The beds were very comfortable and the kitchen, grill, and linens were so useful and plentiful. Thank you, Eric, for being so accommodating! We would definitely recommend this house. It was also right on Stratton mountain that we enjoyed hiking and eating in the village very much. We stayed for our wedding weekend in this home and it was perfect to share with our friends. Kitchen is updated and couldn’t get enough of the hot tub, even in the summer. The fire pit was fun. Eric had some fans delivered to the home too which kept things cool, although vermont nights are never too hot! Hope to come back in the winter next time! Thank you! Perfect for a large group! Everyone fit confortably and all of the homes amenities from the hot tub to the fire place to the sauna really enhanced our stay. The shuttle picks up and drops off right at the driveway, and the drive to the mountain is under 2 minutes. 5 Windtree is comfortable, clean, and the perfect spot for a large group looking to have a good time. Thanks Eric, hope to stay again someday! This was the second time we stayed at this great rental. I am sure it was not the last time. We had a wonderful time. The house is very big and can easily accomodate 12 people. Every single amenity, including sauna and hot tub were great. Eric is a very responsive and caring host. We definitely want to return! Ana, Glad that you had a nice visit. We look forward to welcoming you back, anytime ! Located near the base of Stratton Mountain, free shuttle or 1 minute drive will take you to Vermonts best skiing, hiking, dining, shopping, fitness and spa.